I have to start this post by saying that I was probably the most sheltered kid going into college. I had never been to a party, I had never been exposed to alcohol or to drugs, and I definitely had no idea how to deal with/ help drunk people. I don't think it was necessarily a bad thing but I feel like it definitely shaped my approach and experience with attending parties in college. I went to my first party first semester of freshman year at one of the more crazy frats on campus on Halloween. It probably wasn't the best starting place, but I had a really good time. That night is still one of my favorite memories at Wake. But since then, I've made my way around the frats and learned how to conquer the frat scene fairly well. 1. The More Friends the Merrier: First of all parties are definitely more fun if you know a bunch of people there, but it's also so much safer. I don't know how many times I've heard stories of people losing or getting ditched by their friends at parties. So I definitely believe that the more people there looking out for you the better, whether it's your sorority sisters or just a big group of friends. 2. Stay in your Comfort Zone: I'm usually the type of person to argue for stepping out of your comfort zone, but I think in terms of parties it is fine to stay right where you're comfortable. Sometimes at parties you're tired and you're feeling social pressure and it's a good idea to stick to your core values. Drink, don't drink but make sure the decision is completely your own. 3. Dress Comfortably: Leggings, leggings, and more leggings. At Wake, people don't really dress up to go to frat parties, especially since you'll probably leave with beer/ punch spilled all over you. I'm almost always wearing leggings, converse and then a tee or tank top of some type. Bralletes also are a party lifesaver. It's an outfit that is comfy, is practical, is easy and at the end of the day, you'll never regret wearing it. 4. You Don't Have to Drink: I think one of the most common misconceptions about parties in college is that you have to drink. And I'm here to tell you that you can 100% go to a party without drinking. First of all, I've never been to a frat that forces alcohol on someone that doesn't want it and even if someone does hand you a cup it is so easy to fake it. Everyone makes fun of me for this one but it honestly works; if you don't want to drink it just pour a little bit on the floor every once in a while as you dance around. No one will notice and it'll be gone in no time. 5. Say No/Lie: Drunk frat guys can be slightly aggressive, so it's important to have a plan to get out of a situation you don't want to be in. First of all, always try to stay near your friends so that they can help you out, you can kind of wave to them and signal for them to come over. But if you don't see someone you know nearby or they aren't picking up the signal, check your phone and make up a lie saying that you need to go find your friend. Most guys will at that point get the signal and leave you alone. But regardless, keep lying and saying no until they finally leave and then get the heck out of there. 6. Think Twice: As I said earlier in this post, I believe that sometimes judgment becomes clouded when you're in a frat basement. So maybe think twice before you make out with a random stranger. Ask yourself if you'll be able to deal with the reality of seeing him again every single time you go to that frat. Even decently sized schools become very small, very quickly in regards to boys you don't really want to see. 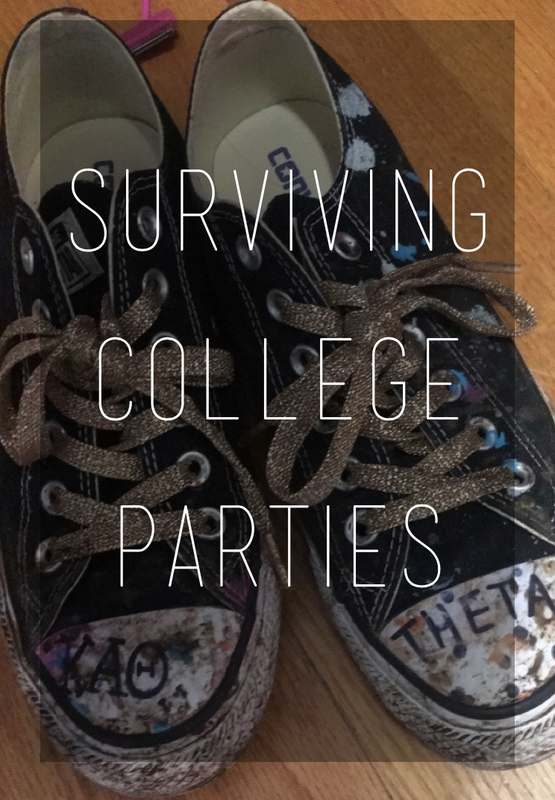 Obviously, I'm no expert on frat parties and all schools do things slightly differently, but I think the best advice is to just be careful and to use your judgment. Always remember that underage drinking is very much illegal and is something that needs to be taken seriously if you choose to do it. But enjoy the party, let loose and have fun dancing with all of your best gals.